During the second half of the nineteenth century, Paris emerged as the entertainment capital of the world. The sparkling redesigned city fostered a culture of energetic crowd-pleasing and multi-sensory amusements that would apprehend and represent real life as spectacle. Vanessa R. Schwartz examines the explosive popularity of such phenomena as the boulevards, the mass press, public displays of corpses at the morgue, wax museums, panoramas, and early film. 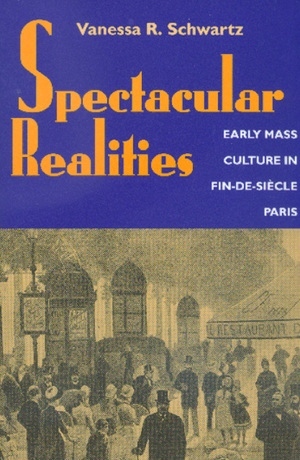 Drawing on a wide range of written and visual materials, including private and business archives, and working at the intersections of art history, literature, and cinema studies, Schwartz argues that "spectacular realities" are part of the foundation of modern mass society. She refutes the notion that modern life produced an unending parade of distractions leading to alienation, and instead suggests that crowds gathered not as dislocated spectators but as members of a new kind of crowd, one united in pleasure rather than protest. Vanessa R. Schwartz is Associate Professor of History at the University of Southern California and coeditor of Cinema and the Invention of Modern Life (California, 1995).